"We don’t question Kim’s expertise on national security, but his ad stretches his résumé to elastic extremes by claiming he was a national security officer for a Republican president," Salvador Rizzo writes. Kim is running in a competitive race in New Jersey’s 3rd Congressional District, a district President Barack Obama won twice but that flipped to President Donald Trump in 2016. Kim’s campaign released an ad that references his work as "a national security officer for Republican and Democratic presidents." Kim’s claim to have worked in high-ranking national security jobs in the Obama administration is accurate. He joined the Obama administration as an Iraq expert in 2009. In 2011, he spent several months in Afghanistan advising Gen. David Petraeus and later Gen. John Allen. He also served as Iraq director on Obama’s National Security Council for two years. According to Kim’s LinkedIn profile, he worked as a conflict management specialist at the U.S. Agency for Aid and International Development (USAID) for "less than a year" in 2005, during the Bush administration. Kim’s resume, obtained by the Washington Post, fills in details about his time in the Bush administration. After graduating the University of Chicago in 2004, he interned at USAID for four months on a Truman scholarship. He returned to USAID in 2005 as a conflict management specialist in the agency’s Africa Bureau. The USAID post was an entry-level position and Kim’s first full-time job out of college. The candidate's campaign gave the Post two statements from former USAID officials who said Kim conducted meaningful work on national security issues. "The work was absolutely in support of U.S. national security and in direct service to the Bush administration's priority to counter the growth of terrorism and extremism in Africa," said Keri M. Lowry, who also served as a conflict management specialist in the Africa Bureau. A strategist for Kim’s opponent, incumbent Rep. Tom MacArthur (R., N.J.), said the ad should be taken down. 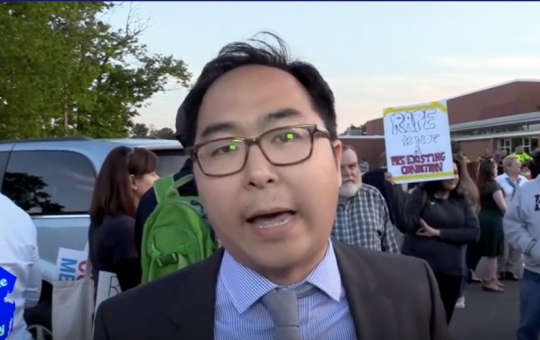 "Andy Kim grossly embellished his résumé at USAID in a deliberate attempt to mislead voters about his background," strategist Chris Russell said. The Post concluded by giving Kim "Two Pinocchios" for his "résumé puffery." This entry was posted in Politics and tagged 2018 Election, Fact Check, New Jersey. Bookmark the permalink.